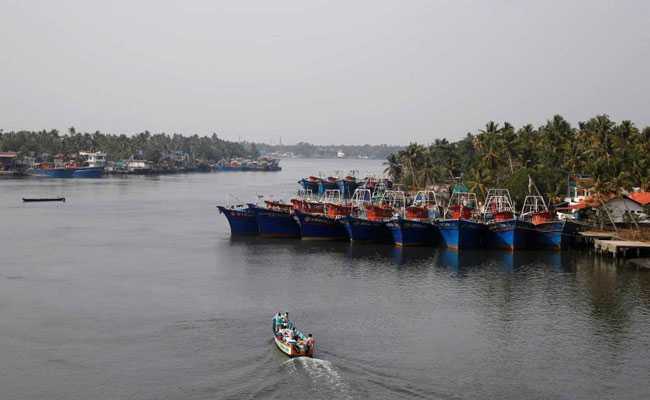 The boat, carrying people from New Delhi and Tamil Nadu, left Munambam harbour in Kerala on Jan. 12, two officers involved in the case told Reuters. In a dark alleyway no wider than arm's length, a woman's shoe is all that remains on the boarded-up doorstep of Prabhu Dhandapani, his wife and their eight-year-old daughter. Prabhu, 30, was one of around 50 residents of a refugee community in New Delhi who left the capital to attempt a 7,000-mile boat journey through some of the roughest waters in the world with the aim of landing illegally in New Zealand, relatives and police said. He is now in custody in the south while his wife and daughter are missing, along with everyone else who boarded the fishing boat that police say left Munambam harbour in Kerala on January 12 carrying more than 100 people. The most likely and shortest route, though the straits between Indonesia and Australia, passes through seas where storms and typhoons are common. More than a dozen relatives of passengers on board the boat, that include pregnant women and young children, told Reuters they left to escape chronic unemployment in New Delhi's Madangir. The residential area from where several people travelled illegally on a boat to New Zealand, in New Delhi. "They had to leave to find jobs, to eat," said Prabhu's mother, Sugana. "They have been promised work in New Zealand." When asked if she knew where the country was, she shook her head. It is the first known attempt by migrants to reach New Zealand by boat from India, and their story is a reminder of the vast challenge of creating jobs for 1 million young people who enter workforce every month. Boats have been setting out from South and Southeast Asia for Australia for a number of years but Indians making the trip have been relatively rare, based on Australian government statistics that show the largest numbers detained there to be asylum seekers from Iran and Afghanistan. Passengers from Delhi left in stages in December and early January. They checked into guesthouses near Munambam, a busy fishing port. They appear to have boarded the boat willingly, said a senior police official in Delhi briefed on the investigation. Their police station had not received any missing persons' reports. Precise numbers on the boat - and who organised it - are unknown. One officer from Kerala investigating the case said around 100 people were on board. A second said it could be more than 200, with the remaining passengers coming from Tamil Nadu. Police recovered more than 70 bags left behind by the migrants, said one of the officers, VG Ravindran. "The bags are full of dry goods and clothes, suggesting they were preparing for a long journey," MJ Sojan, the officer leading the investigation told Reuters. "The people and boat are missing somewhere in the sea." Sugana, mother of Prabhu Dhandapani who was detained on suspicion of being involved sending people to New Zealand. Some passengers, including Prabhu, did not board the boat, and police traced several back to Madangir after finding identification documents in the bags left behind. He was detained by Kerala police less than 10 minutes after arriving back in Delhi, his mother said, and taken back to the state for questioning. Sugana said she did not know why Prabhu did not board the boat with his wife, Anandi, and eight-year-old daughter Trisha. She said he was not involved in people smuggling. Many of the older residents of the Tamil community in Madangir fled Sri Lanka in 1983, when a civil war erupted between the majority Sinhalese Buddhist population and the minority Tamils, living in south India and north and east Sri Lanka. They settled in the area, a few miles from the parliament building and some of the most expensive real estate, but which has suffered from rampant unemployment, residents said. "If we get the chance we will also go: this is a rotten place," said Kanaga Lingam, a Sri Lankan refugee whose son, K. Raghu, boarded the boat with his wife and two sons. There is anger too at Prime Minister Narendra Modi, who came to power in 2014 promising to create millions of new jobs for India's young and rapidly expanding workforce. In fact, India lost as many as 11 million jobs last year, according to a report by the Centre for Monitoring Indian Economy (CMIE) think-tank, putting BJP under pressure before the general election due by May. While the official jobless rate is only 3.5 percent, the last comprehensive labour bureau survey was in 2015-16, and many unofficial estimates say it is much higher, especially if the underemployed, who only work for a few months a year or a few days a week, are counted. Many of those in the Tamil enclave who do work do so as daily manual labourers, a poorly-paid and unstable living. "If I am able I will go to Modi's house and beg at his feet to be allowed to go to another country," said a woman called Bumi, who goes by only one name. "There are a hundred problems here. We have no jobs," said a 32-year-old man, who like many in the area declined to be named, fearing involvement in the police investigation into the boat. Crime is also an issue in the area, primarily theft, the Delhi police official said. The BJP disputes the CMIE figures on unemployment. On Thursday several cabinet ministers pointed to alternative figures from Naukri, an online jobs portal, showing a pick-up in employment over the last year. Many of those Reuters spoke to in the community, centred around a rubble - and garbage -strewn courtyard and several densely populated alleyways, said those on board the boat had been inspired by stories of Indian migrants starting new lives abroad, particularly in Australia. More than 600,000 Indians live in Australia, according to the latest government census, the vast majority of whom arrived legally. There are 155,000 in New Zealand. "People who go to Australia get put in camps for three months," Kanaga said. "After that they get given proper housing. Everything is taken care of." But few of those on the boat had passports, according to several people with relatives on board, and the reality for those arriving illegally is very different. If the boat lands in Australia or is intercepted by its border force on the way to New Zealand, those on board face being sent back to India, or to controversial camps in the South Pacific for long-term detention. "If they don't have visas they would be unlawful maritime arrivals and as such they would be prevented from making an application for a further visa," said Melbourne-based migration lawyer David Harvey. "They would likely be diverted to an offshore processing centre." New Zealand has seen fewer arrivals than Australia, although it now is also trying to warn off illegal migrants arriving by boat. "Any attempt to reach New Zealand will put your life, and the lives of your family members, at great risk," said Stephen Vaughan, assistant general manager of the country's immigration department. "There is every chance you will drown at sea." But in Madangir, residents say the warnings will do little to deter such journeys. "We know about the dangers," Kanaga said. "But it is more dangerous to live here than it is to go.